Finance and Risk Management at St. Mary’s University is a unique and innovative program that synthesizes the two related fields that are in high demand. Students pursuing this major develop the ability to analyze financial market data and recommend sound financing and investment options, as well as to identify, analyze and manage the risks faced by individuals and organizations. Students enrolled in this program gain hands-on knowledge through innovative classes and state-of-the-art information technologies. Finance and Risk Management students have the opportunity to manage a real $2.4 million investment portfolio, work in a simulated trading room and utilize the numerous Bloomberg terminals on campus. In addition, the Finance and Risk Management program fosters opportunities for internships and careers through industry partnerships and specialized events. 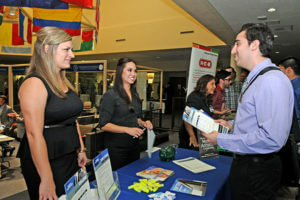 Each fall, the Greehey School of Business hosts the Risk Management and Insurance Career Fair where students can develop their professional network and connect with potential employers/internships. Students can pursue a Bachelor of Business Administration in Finance and Risk Management. In addition to their major courses, students from the Greehey School of Business take courses from the St. Mary’s Core Curriculum and the Greehey School of Business Core. The B.B.A. in Finance and Risk Management at St. Mary’s requires a minimum of 27 credit hours within the major.